"J.B. Handley is arguably the world's most thoughtful, sophisticated, knowledgeable, and indefatigable activist for children's health and safety. As a frontline leader for fifteen years, Handley has led the big fistfight against the Pharma Cartel to force the issue, broadcast the science, and expose the lies behind the vaccine policies that have created an epidemic of chronic disease among our children. ... 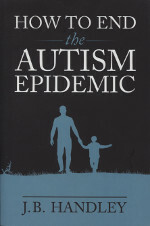 Please read this book and decide for yourself if you still believe that vaccines are 'safe and effective.'" There Is a Choice: Homeoprophylaxis by Cilla Whatcott is written for parents asking the question, “Besides traditional vaccination, what other choice do we have?” Cilla shares her journey of starting out on a conventional medical path and making a dramatic change to homeopathy after her youngest daughter is vaccine injured. How then can the vaccine industry be described in brief? It is a “partnership” between government and private companies in which government pays for most of the research and may even develop and license the vaccine for its own profit, as it did in the case of Gardasil. The same government then reviews the vaccine for safety and efficacy—and surprise!—approves it. This book is also available here in our product list. Humorous and Informative, bringing awareness and critical thinking about vaccinations. If the old adage, A picture is worth a thousand words, is true, then "Vaccination : the Great Illusion", has condensed a library of vaccine knowledge into 136 pages of delightful drawings. French natural health promoter and cartoonist René Bickel reveals the hidden truths behind the enslaving paradigm of vaccines which have poisoned our bodies and minds for over two centuries. Both humorous and educational, René's book pictures the manipulations and disinformation that prevail in the field of vaccination. After the scandals of mad cow disease, tainted blood, growth hormones, and "tobacco science", it is time to expose the biggest scandal in the history of medicine by affirming the truth that vaccinations are dangerous and unnecessary. Bickel's book spans two centuries of relatively unknown vaccine history and includes key references for further research. View several pages of the book here. Jessica's father tells the true story of his family, who found themselves grappling with an extraordinary crisis when their two-month-old baby developed a mysterious and unexpected affliction. Jessica was left severely handicapped and has required total care for the last 27 years. is a moving testament to the power of the body to take care of itself and the trust that people put in that natural process. In this book, based on research with more than 15000 participants from all over the world, you will find stories of families who investigated the vaccine topic carefully and thoroughly because they love and want to protect their children. These stories will educate you to not follow public opinion and propaganda but rather question what is happening and become informed when making decisions that pertain to the health of your children and our future generations." Landrum, SC – Author of a dozen books, including the bestselling Timeless Secrets of Health and Rejuvenation and Cancer is Not a Disease, Andreas Moritz announces the release of his new book, Vaccine-nation: Poisoning the Population, One Shot at a Time; it discloses the serious, long-term health risks of vaccination for children and adults. http://vaccine-nation-book.com/ Note: If you are looking for the movie Vaccine Nation, Click here for the review, and Click here to buy. (Link to review is also available). Ebook – Vaccinosis, the Mark of the Beast on Dr. Jordan's site. An essential guide for parents who want to make an informed choice. Clear explanations and wonderful graphs. "Drawing from his adolescent experiences and observations growing up in Oklahoma City, a long career as a family medicine doctor specializing in the field of environmental medicine at Woodlands Healing Research Center in Quakertown, Pennsylvania, and past decade examining 100+ medical records as expert witness for the defense in alleged non-accidental child injury cases, Harold E. Buttram, MD has written a book entitled A Commentary on Current Childhood Vaccine Programs." Since being unleashed on the public four years ago (2006), the verdict is in—HPV vaccines have caused a toll of injury and fatalities to thousands, if not millions, of girls. Consumer advocates have urged the FDA to intercede in this atrocity, and to pull the vaccines from the market. Of course, this is unlikely. The best protection is always KNOWLEDGE! The Biomedical Paradigm describes the underlying philosophy or pattern of thinking behind Modern Medicine. What if the Biomedical Paradigm is fundamentally flawed, resulting in 95% of Modern Medicine being scientifically and medically wrong? Against Compulsory Vaccination, Case against Hepatitis B Vaccination, Diet information, etc. Way back in 1998, the Australian Vaccination Network – comprising parent and health – professional run groups from across Australia – compiled, published and printed a book called Vaccination Roulette. A massive effort was made by so many individuals and the final result was a true act of love and caring. This landmark publication covered the cost of printing before its release in pre-sales and has sold on a steady basis ever since. This book is as relevant today as it was 15 years ago when it was first released. The parent’s stories will touch the hearts of anyone and the medical journal references are indisputable evidence that vaccines are neither as safe nor as effective as those in the government and the media would like you to believe. The AVN has put together a pdf version of Vaccination Roulette and is offering it free of charge for anyone who would care to download it. This book is text searchable and can be shared with anyone so feel free to forward the link to friends, families and anyone else who would be interested in reading this. This .pdf file may not be changed, altered or sold by anyone other than the AVN without prior consent of our management committee. IMMUNIZATION: The Reality Behind the Myth by Walene James -- Forward by Robert Mendelsohn, M.D. Vaccines: Are they Really Safe and Effective? by Neil Z. Miller, original edition. Vaccines: Are they Really Safe and Effective? by Neil Z. Miller, Update/Revised Edition. Immunization, History, Ethics, Law and Health by Catherine Diodati, M.A. Virology "Fear of the Invisible"
I decided to write No Vaccines for Me! because, although many books and Web sites about vaccine dangers and side effects are available for parents, I could not find any resources for a younger audience. There were no family books available for parents to use to educate their children. Thus, No Vaccines for Me! as a family book and not as a children’s book. It is intended as a resource for like-minded parents and professionals who choose not to vaccinate and who wish to make informed decisions about vaccinations, nutrition, and overall health. It is not intended to be controversial, although it may be viewed as such. Book: Book Review - Every Second Child by Archie Kalokerinos, M.D. Book: Lifestyle Choices ...Up To YOU! DVD: "shoot'em up the documentary"
DVD: What Really Happened at the IOM?